Hope you all had a great hump day! That much closer to the weekend! I finally took pictures of second half of my February hauls. (See first half here)This will be my last big one for a while, I am going to be limiting my polish buying for the next few months. I have accumulated polishes so quickly that I have not had a chance to use them all, so I will be playing some catch up. :) And I may or may not be running out of storage space. . .
Gilt City offered a $40 voucher for bloom.com for only $20! Some new customers were able to snag a $15 off coupon too so it was only $5! I was one of those lucky few. Due to high demand the promo was changed and new customers were offered 20% off their order vs. $15 off. Still a great deal for some new polish though! I picked up a couple more bottles of Cult Nails Toxic Seaweed after the presale was over (not pictured) and snagged some other colors while in the process. I am looking forward to some of the new colors that will be launching since I now have pretty much all of the colors I want from the existing collections! My local K-Mart did not have all of the Jordana Glitters available so I ordered a few directly from their website. They cost a little more online($2.99 vs $1.99) but at least the shipping wasn't too bad. And I didn't have to drive around to a bunch of different stores trying to find them. I placed a small order with Llarowe for the last of the Hits that were on my wish list. I had been waiting to get Hefesto forever! I kept missing it whenever it came back in stock! In my search for indie polish I came across Elixir Lacquers. There are a few more I would love to order, but I had to get my hands on these ones first! I can not stay away from Etsy! Windestine had 2 more polishes listed that I just had to have! Both of these colors are so unique and down right gorgeous! 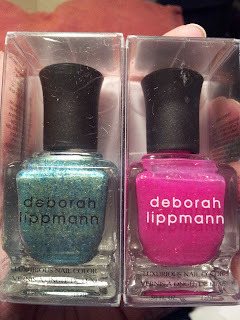 And you guessed it, more polishes from Etsy shops! I got 1 more from Pretty & Polished and also bought my first colors from Dollish Polish! I just can't get enough! Up close photos below! Finally, here are some random polishes I picked up in some swaps thanks to a couple of nail polish exchange groups on Facebook. I was able to unexpectedly cross some major lemmings off my list! Whew! It's alot of work putting together these haul posts! NOTD posts are so much easier, I will be looking forward to a little break! :) I am already on my 4th green manicure for the month! Behind in posts I know, but I will get one up tomorrow! Hope you enjoyed seeing my haul, goodnight! Hot damn you've been busy! Your bank account must be tired! I'm so jealous though, you've got quite an impressive haul there! Hey Brittany! I wrote the post about the draw on my blog, stop if you want :) A kiss and have a good weekend! PD: I love the matte nail polish, only around for Spain not find them anywhere.